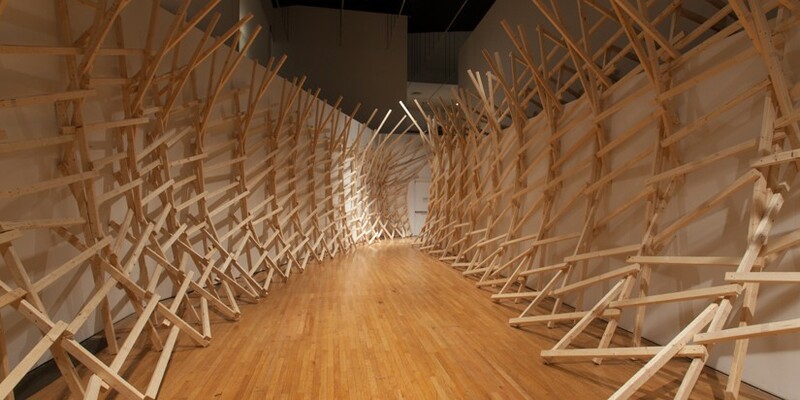 Entre Fronteras: An Architectural Intervention is the second in the Shelley and Donald Rubin Exhibition Series at the Queens Museum, coming on the heels of Citizens of the World: Cuba in Queens, an exploration of Cuban visual artists living both on the island and in diaspora. Entre Fronteras brings two Cuban architects, Yoandy Rizo Fiallo and Osmany Abel García Fuentes, from Havana, Cuba to Queens to work collaboratively on an experimental residency-exhibition hybrid that will result in architectural interventions in both the Queens Museum and Immigrant Movement International, the Museum’s long-term Corona, Queens project space conceived by Cuban artist Tania Bruguera. 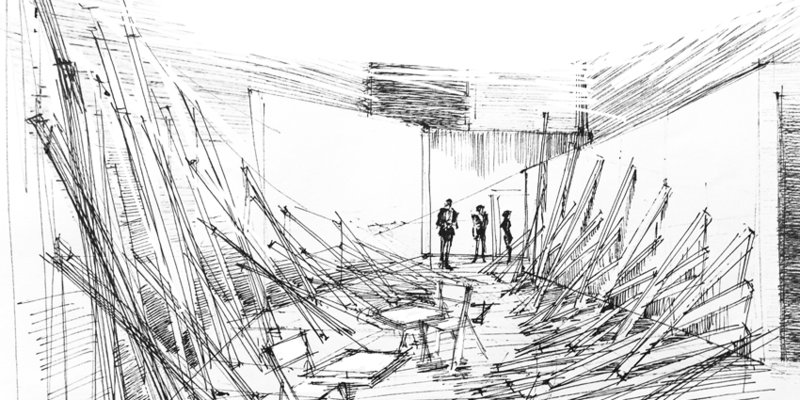 At the Museum, García and Rizo will transform a gallery into an interior courtyard—ubiquitous in old Havana buildings—transporting the audience to their native Cuba. The ‘courtyard’ will function as a politically neutral space that can foster a foundation for new relations, a place where islanders and non-islanders can "be Cubans.” "Our country is built both on and off the island. In this exhibition, Cuba opens its chest, still under construction, with scaffolds and props to show its most intimate and visceral feelings, because the issues of migration must be understood from the heart, not the head.” — Yoandy Rizo Fiallo and Osmany García Fuentes Their work will evolve throughout the duration of the residency-exhibition, utilizing re-purposed or recycled materials and focusing on the creation of architectural structures, furniture, and drawings. Following their residency at the Queens Museum, García and Rizo’s constructions will move to Immigrant Movement International, an ongoing socially-engaged art project, which serves its community by acting as a think tank for immigrants’ rights, a lab for socially engaged art practice, an educational platform and a community space. Through conversations with IM International’s governing body of community members, they will identify and address issues important to local residents. Rizo explains that, "living and working in Queens has made me reflect on the importance of cultural self-confidence for social development.” The collaboration between these contrasting sites, the institution and the community center, provides a space for cultural exchange where Cubans, members of IM International and the community of Corona, Queens can share experiences, learn and educate each other. Osmany Abel García Fuentes (b. 1983, Mantazas, Cuba) graduated from the Polytechnic Institute José Antonio Echeverría (ISPJAE) in Havana, Cuba, with a degree in Architecture. In addition, García is an accomplished artist who holds a degree from the Academy of Fine Arts San Alejandro, and is currently completing coursework for a Master’s in Art from the Superior Institute of Art (ISA), both in Havana. Yoandy Rizo Fiallo (b. 1982, Pinar del Río, Cuba) holds a degree in Architecture from the Polytechnic Institute José Antonio Echeverría (ISPJAE) in Havana, Cuba. Rizo is an independent architect of both residential and commercial buildings. He was selected by Ricardo Porro for Skyline Adrift: Cuban Art and Architecture at Omi International Arts Center (Ghent, NY) in 2013. 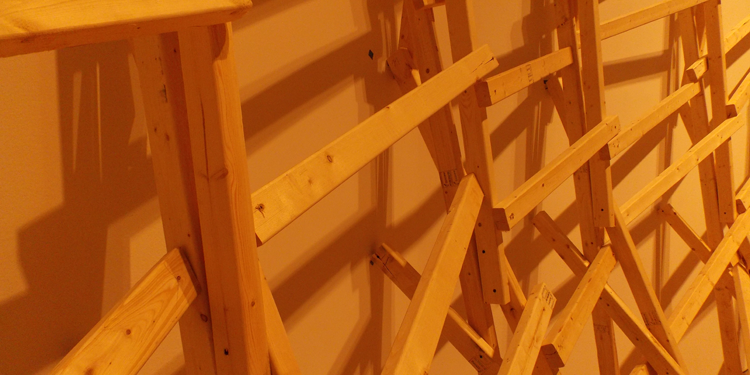 Entre Fronteras: An Architectural Intervention is organized by guest curator Rachel Weingeist. Entre Fronteras: An Architectural Intervention is supported by grants from the Rockefeller Brothers Fund and the Shelley and Donald Rubin Foundation. Additional support from the New York City Department of Cultural Affairs and New York State Council on the Arts with the support of Governor Andrew Cuomo and the New York State Legislature. 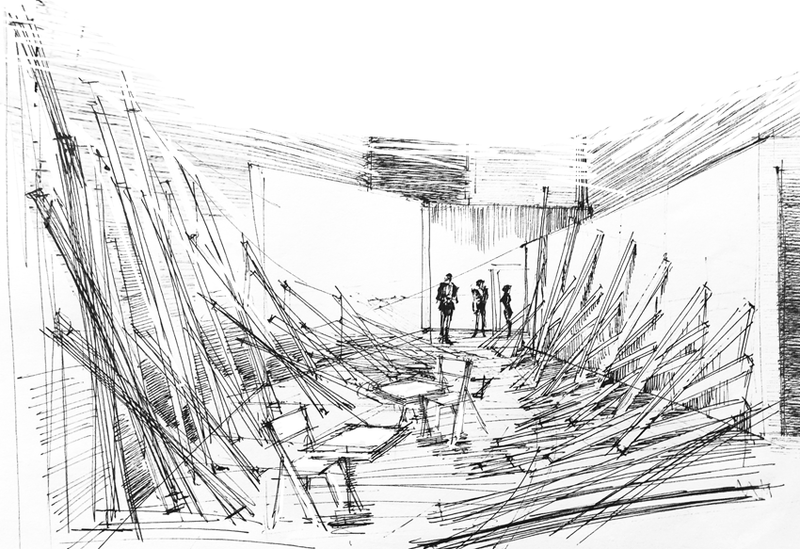 Osmany Abel García Fuentes, Image rendition of Entre Fronteras: An Architectural Intervention, 2014, ink on paper. 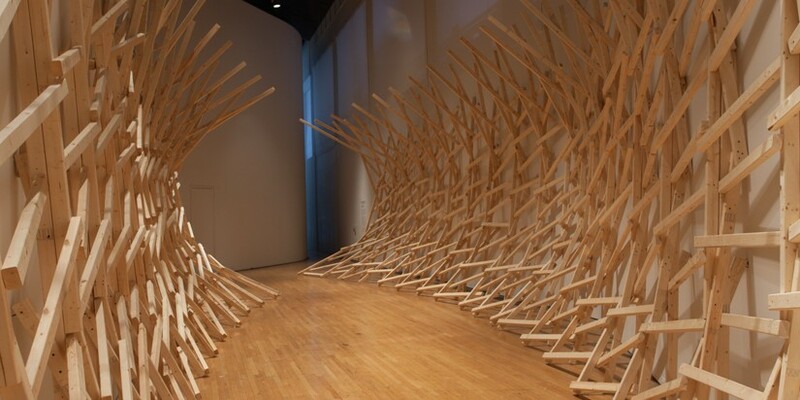 Osmany Abel García Fuentes and Yoandy Rizo Fiallo, Installation view of Entre Fronteras: An Architectural Intervention, 2014, Queens Museum. Photo by Peter Dressel. 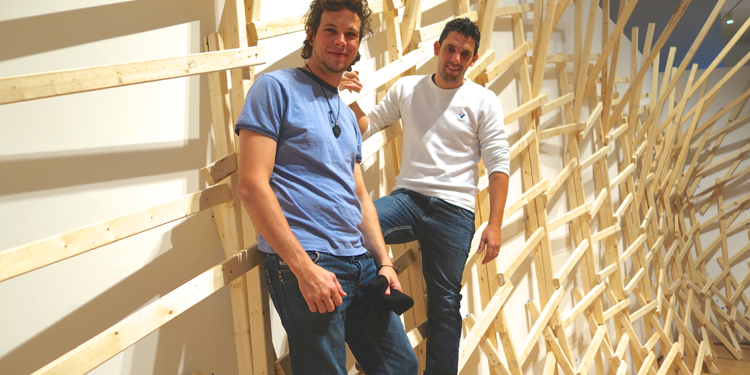 Pictured: Artists Osmany Abel García Fuentes and Yoandy Rizo Fiallo inside the Entre Fronteras installation. 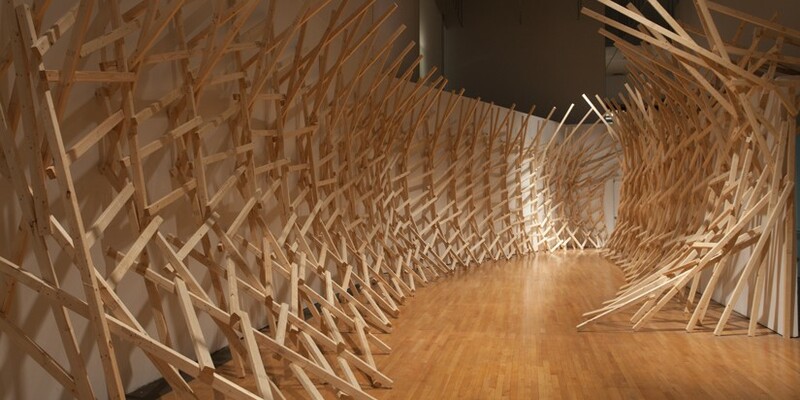 Osmany Abel García Fuentes and Yoandy Rizo Fiallo, Installation view of Entre Fronteras: An Architectural Intervention, 2014, Queens Museum.